But with the external threat gone, the Earth has become a battlefield once more. The children of the Battle School are more than heros; they are potential weapons that can bring power to the countries that control them. One by one, all of Ender's Dragon Army are kidnapped. Only Bean escapes; and he turns for help to Ender's brother Peter. 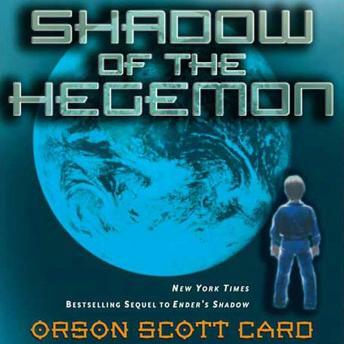 Shadow of the Hegemon is the second novel in Orson Scott Card's Shadow Series. I do like the book series. With the common enemy destroyed mankind goes back to feuding with itself. Despite the warnings of Locke (aka Peter Wiggin) the battle school children are returned to their parents with the hope to give them back a normal childhood. Promptly they are abducted to serve the purpose of one man's effort to rule the world. This book will be a disappointment to the sci-fi fan because there is little high-tech in it, but lots of political strategy and insight in the human spirit. A must for all who read Ender's Game and Ender's Shadow. This is an excellent addition to the Ender Wiggin story. Here we find out about Bean’s origin, which is a shock, at least to me. Bean and Petra are extraordinarily bright and cleaver. If you liked the Ender Wiggin saga, you will most certainly enjoy this. The Sci-Fi enthusiast, new to this tale, may come away somewhat dissatisfied as the only Sci-Fi here is the idea Ender and Valentine are off world. To appreciate this story I highly recommend “Ender’s Game” before listening to this story.